dB-Bloc is your how to solution for soundproofing interior walls and ceilings. dB-Bloc is an ultra thin, ultra dense sound barrier membrane designed to layer behind drywall to help deaden sound bleeding through common wall and common floor/ceiling assembly systems. 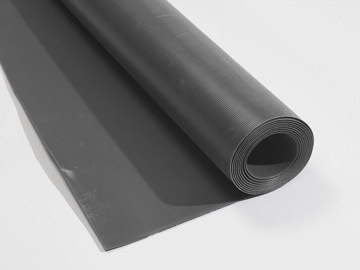 The net effect of this heavy soundproofing membrane is to deaden structure born vibrations by adding mass to your existing surface. The density of dB-Bloc will impede your vibrations and lower the level of sound wave energy that is able to transfer through your common surface to the adjoining space you seek to protect. dB-Bloc is shipped in 54” x 30’ rolls. Each roll will weigh 150 pounds and cover 135 square feet. Orders can be placed online using the link to the left or by phone to 1-800-638-9355. 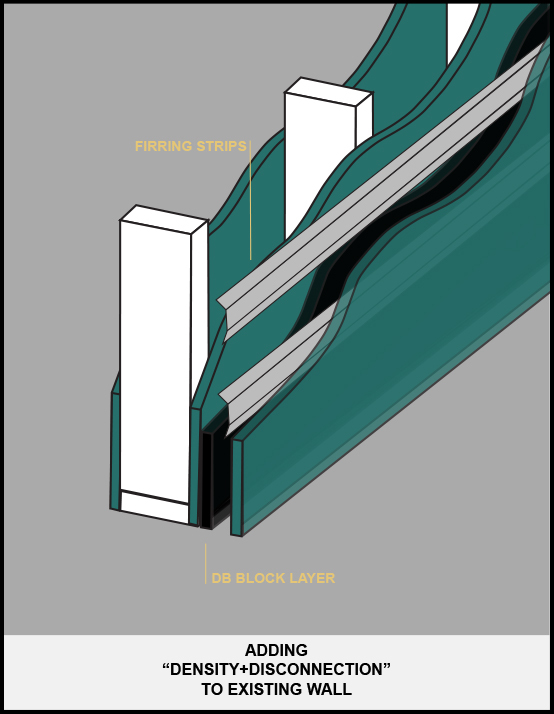 The illustration shown here show the channels separating your finished drywall layer from the framing structure. The resulting dead air gap is where the sound wave will collapse. See the Demo below. A popular technique for your channels is to start with our RSIC Clips and anchor those to your wall once the dB-Bloc is in place. Then snap hat channels into the clips and complete with your drywall. Notice the difference in our disconnection techniques. If you double wall or stagger stud your framing, it negates your need for isolating your assembly with a channel system or the RSIC Clips. Either of these building techniques is separating the rooms that would otherwise be conjoined by the framing system. Simply add the density of dB-Bloc to either of these disconnecting techniques, and you’ve got the collapse in the transmitting sound wave that you need. 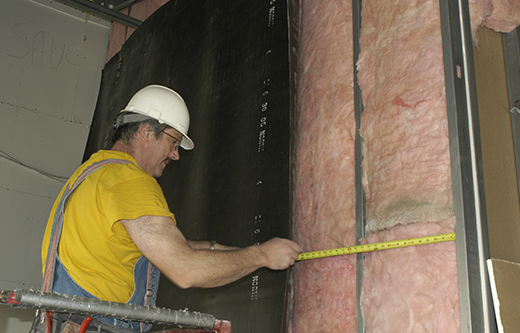 A properly installed dB-Bloc soundproofing treatment can take an average STC rated wall of 38-40, and deliver back an STC rated wall of 55-60 or stronger, which is luxury grade soundproofing as rated by the US Government. Leakage of course will decay all results on all projects no matter what. Any common surface that shares electrical, plumbing, ventilation, adjacent untreated walls, floors, ceilings, windows, hallways, stairwells, doors and more will combine to leak noise. While there is no complete “cure” to sound isolating one room’s noise from the next, there is certainly better “control” you can deliver over your environment using this dB-Bloc material. On average, the soundproofing treatment can deliver a 10-12 dB drop. To experience what that collapse in sound might sound like, visit our Sound Chamber. 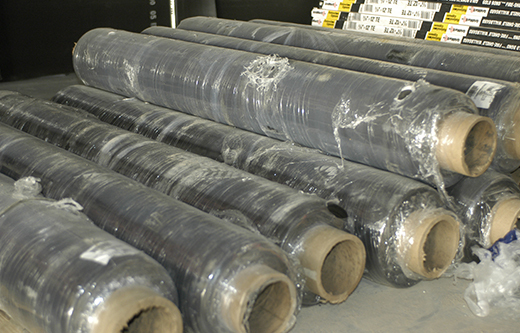 dB-Bloc is shipped in 54″ x 30′ rolls. Each roll will cover 135 sq ft and weigh nearly 150 pounds. The density is what makes the treatment perform, but also makes the shipping weighted. Care should be given as to how you will accept the order. Most clients opt for a lift gate that lets the pallet be lowered to the ground. Please inspect the order upon delivery and sign for anything that may have been damaged in transit. For questions related to your shipment, call our help desk at 1-800-638-9355. If you are a contractor that has discovered the art of soundproofing a common surface with the use of our dB-Bloc layering sequence, we welcome you to our family of builders who know how to do it right. For you, we offer a free newsletter that delivers timely and helpful insights into the art of combating sound bleed through common wall or floor/ceiling assemblies. Sign up today and help spread our dB-Bloc treatments to future clients of yours! dB-Bloc is our top selling product at NetWell Noise Control. This is a ultra thin sound barrier membrane designed to layer behind drywall to help deaden sound bleeding through a common wall or a common ceiling/floor assembly. Without the density of dB-Bloc, your surfaces are able to accept vibration and pass along the sound wave. Adding dB-Bloc to your surface is the equal to placing the flat of your hand on a tuning fork. This kills the vibration, and therefore kills the sound that would otherwise come with it. Layering dB-Bloc to your perimeter wall or ceiling surface serves the same purpose. Most common walls are built with a single frame and drywall on both sides. When sound is produced in room A, the sound waves hit the common surface, convert to structure born vibrations, pass through the framing, and release on the other side. Much like a string pulled tight between two coffee cans, the framing in your wall is conducting vibrations. By layering dB-Bloc and a disconnection into your assembly, you are forcing the collapse of the vibration, protecting the adjoining room from your noise. Once your surface receives the dB-Bloc treatment, the sound wave is no longer able to freely transmit from room to room through structure born vibrations. Up to 90% of your sound bleed can now collapse inside the assembly you have created, rather than pass through to the adjoining room. There’s a measuring standard in the sound business called an STC value. This stands for Sound Transmission Classification. A standard wall with framing and drywall on both sides, will carry an STC of 38-40. On the STC scale, government standards for a “luxury” rated wall will build to an STC level of 55+. Once you apply the dB-Bloc layering treatment to your common surface, our goal with your project is to deliver this luxury grade rating. If you hit an STC of 55+, you are forcing the collapse of up to 90% of your unwanted noise transmission. Flanking paths are leakage points that will decay your values back. Every room, every wall, every ceiling, will have them. From doors, windows, outlets plates, supply/return vents, plumbing fixtures and more, there will be air pockets that bleed noise regardless of your best efforts to block it. Also, the invisible flanking paths are all the structural connection points that will deliver vibrations up, down, over and around your treatment. Remember that common floor slabs, common ceiling structure, and perimeter walls that you choose to not layer with dB-Bloc, these surfaces can all collect the energy and deliver it around your dB-Bloc treatment. Sound waves pass through common structure like an electrical current, any direction, traveling nearly 800 miles an hour. Flanking paths are the reason that no sound barrier treatment will block 100% of your noise, but we can get you close! 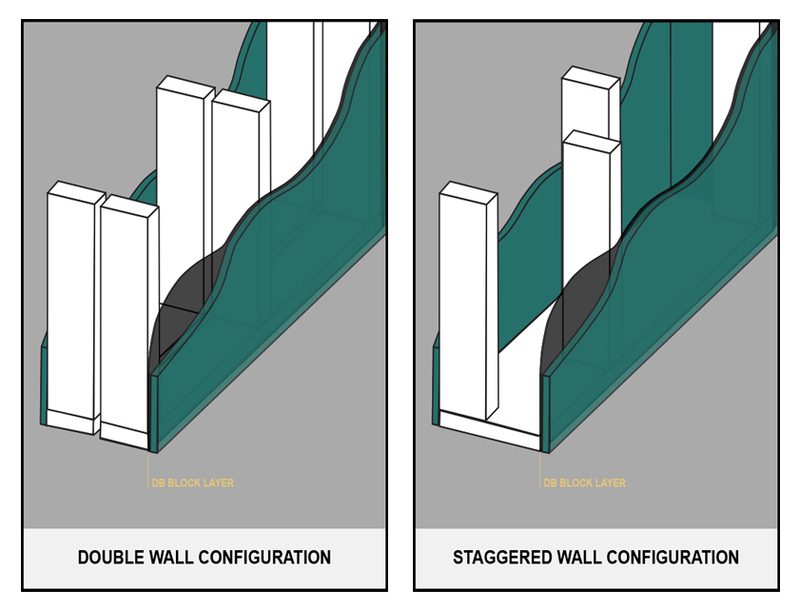 Unless you have a double wall, a disconnected structure already, or a staggered stud wall, the answer is yes. 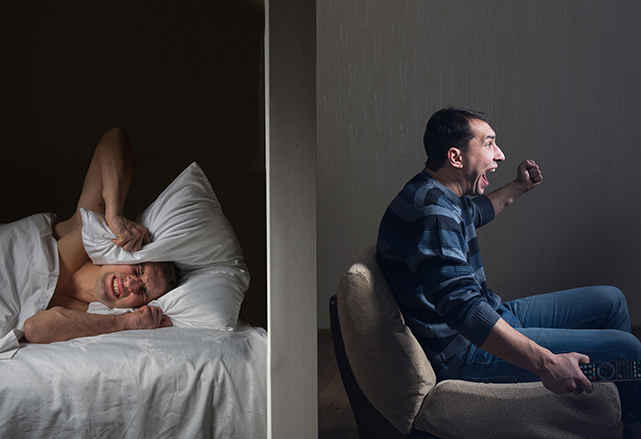 You need to force a break in the contact points between the adjoining rooms. NetWell offers RSIC Clips if you are interested in the upgrade, otherwise a standard set of resilient channels will work fine. Most of our clients are indeed retrofitting to an existing finished wall or ceiling assembly. Simply staple the dB-Bloc into place, add your channel system, and then a new layer of 5/8” drywall. Yes. The same layering sequence as perimeter walls will receive, anchor dB-Bloc to your ceiling, add a channel system and/or our RSIC Clips, and a new layer of 5/8” drywall. Yes, but note that we do offer a flooring underlayment called FloorFighter that we recommend you substitute in for the dB-Bloc. FloorFighter carries the same level of density, but also has more of a cushioning effect to decouple foot noise. dB-Bloc should cover 100% of a common surface. Note that where ever you opt to not layer in the treatment, that becomes the path of least resistance where the sound waves will flow, pass through your assembly, and decay your values back. You can order dB-Bloc right here on our website, or by phone to 1-800-638-9355. We ship the material in 54” x 30’ rolls to cover 135 sq ft per roll. dB-Bloc is typically a stock item ready to ship within 24 hours of your order.